Ashton Kutcher is an American actor and investor, and is notorious for starring in romance/comedy films; such as Just Married, What Happens In Vegas, and Dude, Where’s My Car? He’s also hosted the TV show Punk’d, and had a regular role in Two and a Half Men since 2011, replacing the one and only Charlie Sheen. Kutcher is now married to the actress Mila Kunis, and they have two children together. As of 2019, Ashton Kutcher’s net worth is roughly $200 million, making him one of the richest actors in the world. Christopher Ashton Kutcher was born on the 7th February, 1978, in Cedar Rapids, Iowa. His parents are of Czech, German and Irish descent, and his mother Diane worked at Proctor & Gamble, whilst his father Larry was a factory worker. Kutcher has two siblings; an older sister called Tausha, and a twin brother called Michael, who has cerebral palsy. Michael is a spokesperson for the advocacy organization Reaching for the Stars. Ashton said he kept himself very busy growing up, mainly because of being stressed by his brother’s condition, and not wanting to come home to more bad news every day. He attended Washington High School in Cedar Rapids for a year, before moving to Homestead and attending Clear Creek Amana High School. As a teenager, Kutcher was already interesting in acting. He was also depressed from his parent’s divorce when he was 16, and shortly ended up down the wrong path. He was convicted of third-degree burglary, and sentenced to 180 hours of community service. Kutcher briefly attended college at the University of Iowa, but dropped out to pursue a professional modelling career. After dropping out of college, Ashton Kutcher signed a modelling contract with Next modelling agency in New York. He appeared in commercials for Calvin Klein, and modelled in Paris and Milan. His first role as an actor came in 1998, when he was cast in the TV show ‘That ’70’s Show’. He starred in the show for 8 years, and during the early 2000’s, he began his movie career. In fact, Kutcher starred in many roles between 2003-2005, which you’ll see below. Aside from his successful film career, Ashton has hosted the TV show Punk’d, and also starred in Two and a Half Men, after replacing Charlie Sheen in 2011. And, aside from acting completely, Kutcher is quite a savvy investor. He’s invested in a lot of startups over the years; in fact, over 60 of them. These include the likes of Airbnb, Skype, FourSquare, ResearchGate, and Zenreach. As of 2019, Ashton Kutcher’s net worth is estimated at $200 million. Great questions cause us to sit for days and ponder a solution. They expose problems, and problems are the seeds to solutions. Great questions expose road blocks, which are an entrepreneur’s opportunity. A great question sometimes will arrive at a no, which is the playground for a rebel spirit. The best thing to do is build up this reservoir, this library, of extraordinary advice that you can access anytime you’re in crisis. And that’s what I do. The sexiest thing in the entire world is being really smart. And being thoughtful, and being generous. Everything else is crap, I promise you. It’s just crap that people try to sell to you to make you feel like less, so don’t buy it. Be smart, be thoughtful, and be generous. Generosity has to be at the core of anything and everything we do. Some of the best advice I ever received is somebody once told me that the difference between good and bad is very simple. “If you want to be a real entrepreneur, you have to be the cause. You have to be the creator of somebody else’s new reality, which eliminates time, space, motion, pain, friction. Ashton Kutcher is one of the richest actors in the world, and also one of the most loved. In 2019, it’s estimated that Ashton Kutcher’s net worth is $200 million. 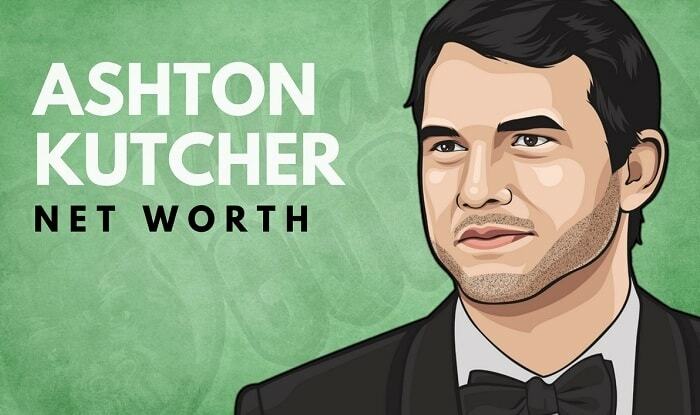 What do you think about Ashton Kutcher’s net worth? Leave a comment below.